U.S.-based material producer PPG and wireless power company Powercast have announced a joint development agreement to produce wirelessly powered printed electronics products for applications such as smart consumer packaging and smart ID cards. By leveraging the expertise from each other, the project will combine substrate and conductive inks from PPG and receiver technology of Powercast to develop LED-based wireless illumination solutions. With the technology, consumer packaging can light up itself to showcase products on a shelf. For smart ID cards, it can be illuminated to permit or deny access to restricted areas or to verify user credentials for safety enhancement. The illuminated products are created by printing graphics or information on one side of the PPG Teslin substrate and the electronic circuitry is printed onto the opposite side of the substrate with PPG’s conductive inks. Then, Powerharvester, a thin wireless power receiver chip developed by Powercast and other components would be attached to the substrate using conductive epoxy, and the label is laminated to seal in the electronic circuitry. Through the integration of technologies, the solutions can seal electronics into packaging and cards via lamination to provide indefinite illumination without direct contact with a power source. The two companies will showcase wireless illumination applications for smart packaging and ID cards at the IDTechEx Show with the first showcased application, a PPG Teslin label affixed to the front of a six-pack of beer. 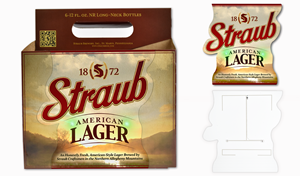 The beer package will light up and draw attention to the Straub brand. The second application is a smart ID card that authenticates a user based on proximity to an ID reader.